Varnish and Leather. 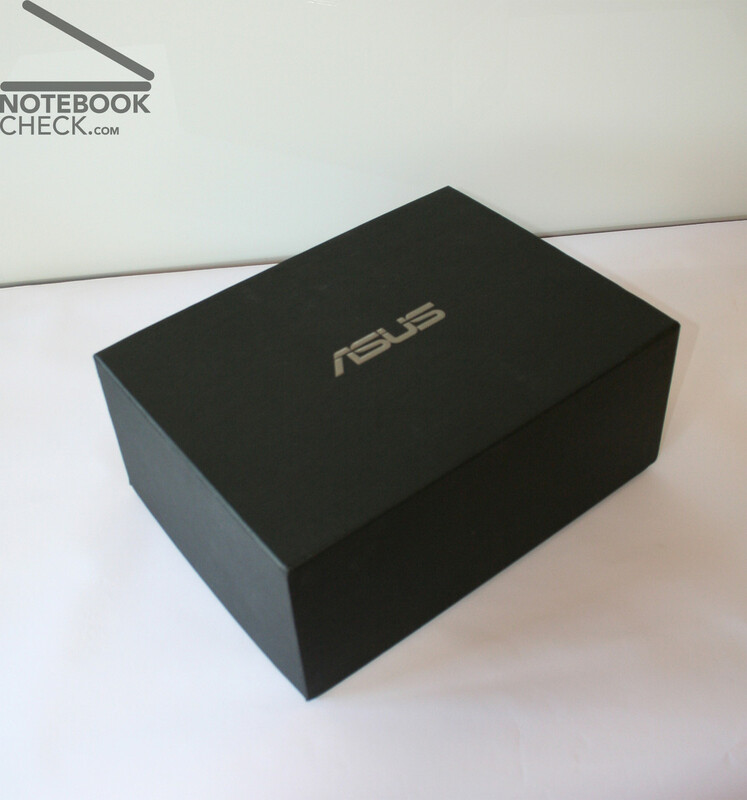 Something special came in our editorial office, the Asus U1F. Beginning with the nice package, an external drive, a Bluetooth mouse in a cloth bag to a supplement battery. But, the 11,1" small notebook did not only impress with accessories. The leathery palm rest areas are also one of the highlights of this completely designed piece. 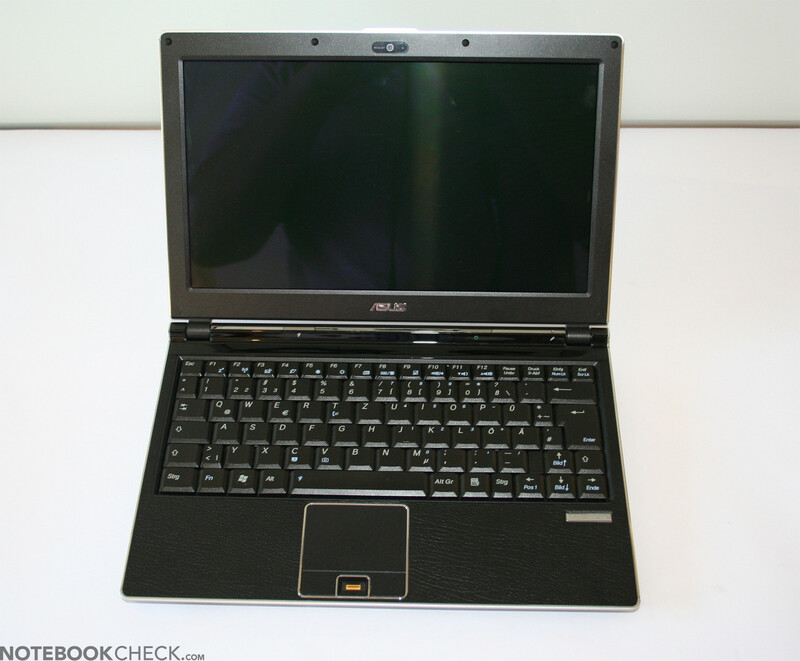 However, how does this Asus notebook rate in the main criteria? This is covered by the following review. The Asus U1F's design impresses also with a lot of successful details. 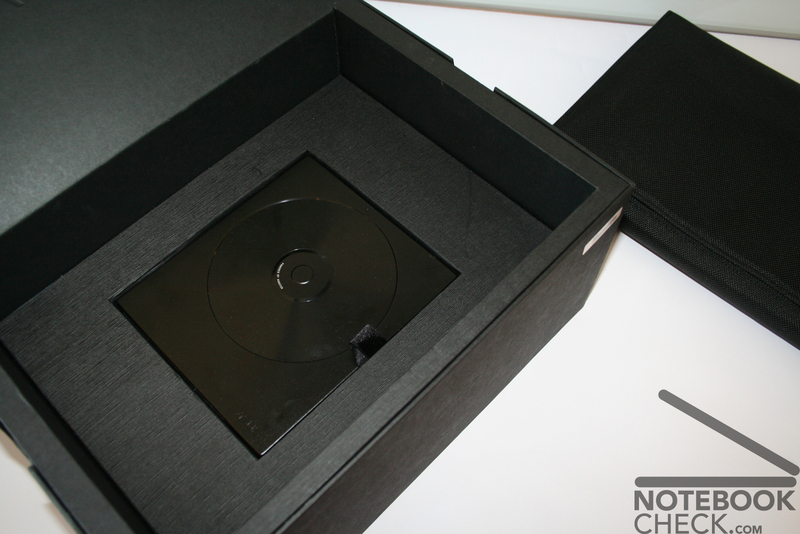 If closed the glossy display cover framed by a metal molding around the case and the display strikes most. Open, the leathery palm rest areas are the most striking feature, but it looks alsmost artificial. However, it actually smells like genuine leather and the natural wear and staining should convince the rest of the doubter. Anyway, it does not only look good, also the haptics is very user-friendly. 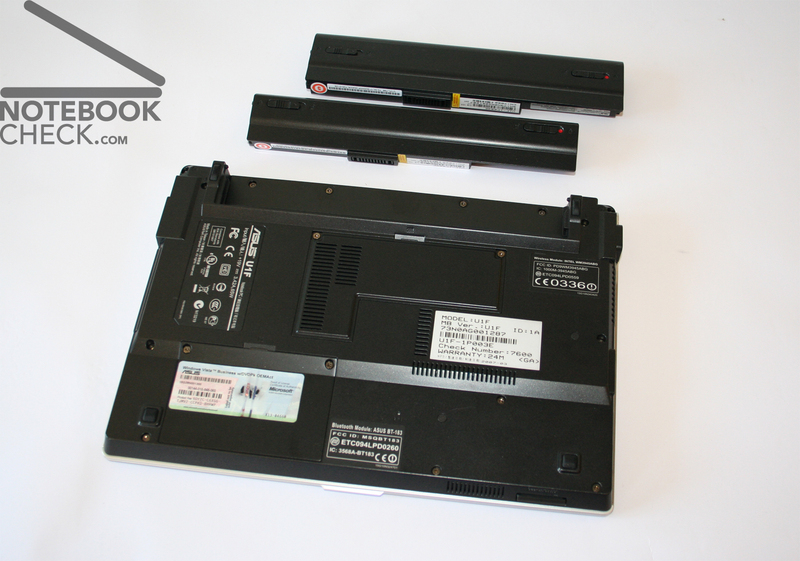 Also the workmanship of the Asus notebook elates: This notebook is sufficiently pressure resistant and the flexural rigidity is excellent. Even the very thin display hardly creaks and seems very stable. We had the same impression of the provided external drive. It's a shame that a mechanical transport lock was (probably due to lack of space) missed out. In turn, an integrated web cam and a fingerprint reader are provided in front of the touch pad. The workmanship of Asus' keyboard is alike the rest of the notebook good. The travel is short with a clear point of pressure. The layout is clear, the right Ctrl key is a little smaller, in turn the cursor keys are sufficiently big and the left Ctrl key and the Fn key have the usual order. 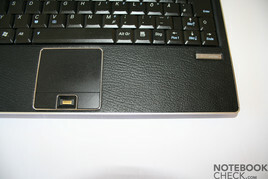 The surface of the touch pad is very plain without being slick at the same time. However, it should be a little bigger. Unfortunately, the keys in front of the touch pad have a hardly recognizable point of pressure. The U1F provides only one hot key, but this one is worth special consideration: This hot key allows adjusting the energy saving settings, which can either maximize performance or battery runtime. At the same time the display's brightness is also adjusted. 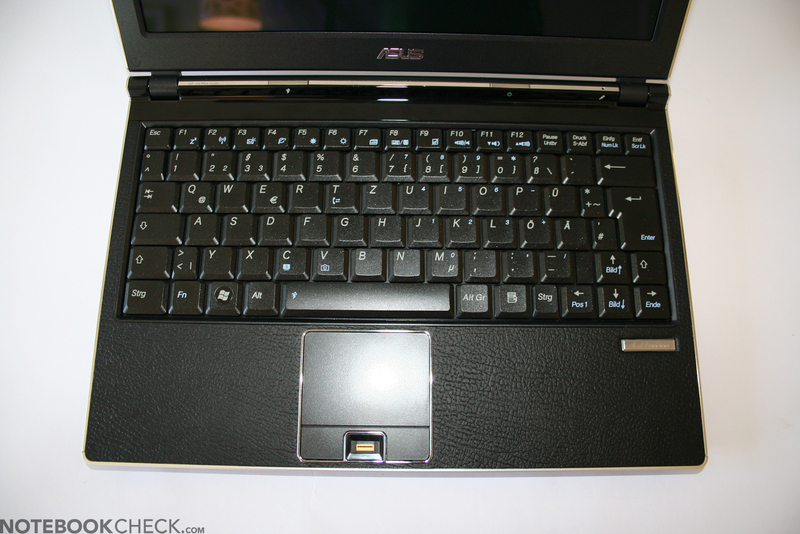 The Asus' display has some special features: E.g., the Asus does not provide a display format usual for notebooks, like 4:3 or 16:10. Instead it has a 16:9 format, a standard format for TV, together with a resolution of 1366x786 pixels, better known as "HD-Ready" in TV terminology. So, videos and films in 720p can be watched without problems. Unfortunately, most applications can only be configured for standard resolutions, so, the native resolution of the display can not be used all the time. 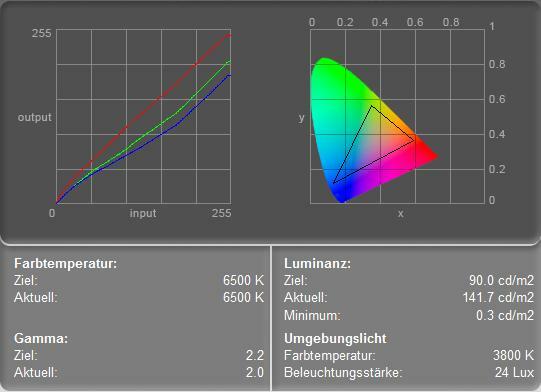 The measured black value of the display is 0.3 cd/m², which is very low, so black is intensive and dark. The maximum brightness of 141.7 cd/m² is rather average. Also the color representation is average, as the green color curve is lowered and the blue color curve is clearly lowered. Subjectively, it seems as if the Asus U1F's display is rather blurry. Furthermore, the viewing angles are vertically as well as horizontally average, so, the area of operation is rather narrow. Unfortunately, the reviewed notebook was only equipped with 1 GB main memory. Together with the U2400 Core Duo energy saving processor and the integrated video chip the performance of the U1F was rather poor. Combined with Vista even office applications and standard windows functions are very slow. Especially at program launch and during software installation there was often no reaction for seconds. For sure, this is a problem due to too little main memory. Unfortunately, the Asus U1F can only be equipped with a maximum of 1.5 GB main memory, because 512MB are soldered and the single RAM bay can only take up up to 1 GB modules. The desperately needed additional 512 MB main memory are provided by the more powerful and 100€ more expensive U1F-1P038E. Furthermore, this model is also equipped with a 100 GB hard disk, and a U7500, which is an equally clocked Core 2 Duo CPU (1.06 GHz) with better performance. The more up-to-date CPU and the additional main memory still do not make a king of performance out of the U1F, but, the office performance should be clearly improved. 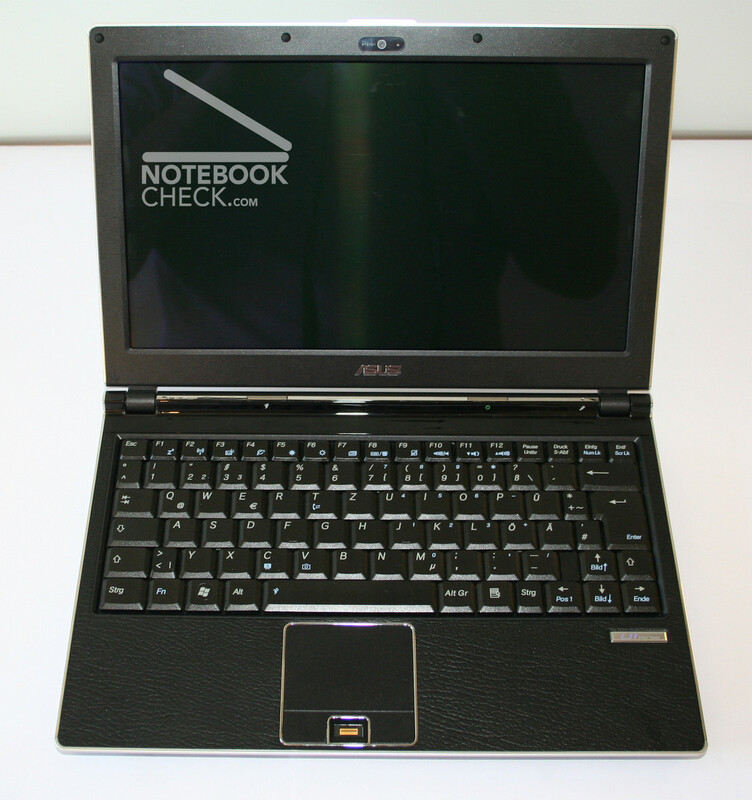 The noise emissions of the Asus U1F can be neglected, during normal operation the notebook is hardly audible. Actually, we had problems during our measurements, because the noise of the environment was most of the time too loud. Only sometimes you can hear a clicking noise of the hard disk, but its never disturbing. The external DVD drive is, too, very quiet, and can only seldom be heard. Additionally, also the keyboard is very quiet. Regarding temperature emissions of the Asus U1F you need to differentiate between top and bottom side: Whilst the temperature at the bottom side reaches a maximum of 50°C, which is hardly tolerable, the palm rest areas stay comfortably cool. 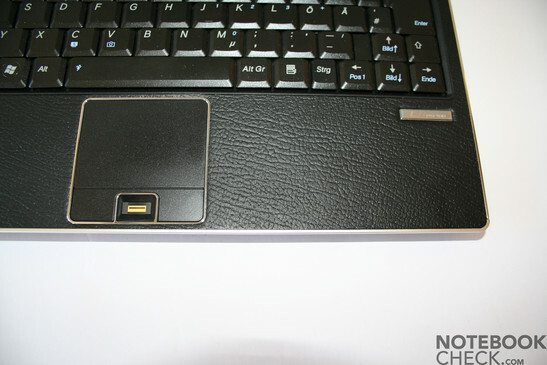 So, this Asus notebook should rather not be used at the lap, but, for use at a desk its alright. The single mono speaker at the left front is sufficient for windows sounds and flash animation, but music or even films should rather not be tried. The basses and the maximum loudness are too poor. However, for the U1F's intended area of operation it is sufficient, because most users won't use them anyway. The battery runtime was measured with the more powerful of the provided batteries. Whilst the 3 cells battery fits perfectly into the case, the 6 cells battery exceeds the case by about 1 cm. Because the weaker battery has half the capacity of the more powerful, you can expect that the runtime is about 50% longer. The runtime of the 6 cells battery is alright. A DVD playback of about two and a half hour is satisfying and a maximum runtime of 4h and 34 min as well. 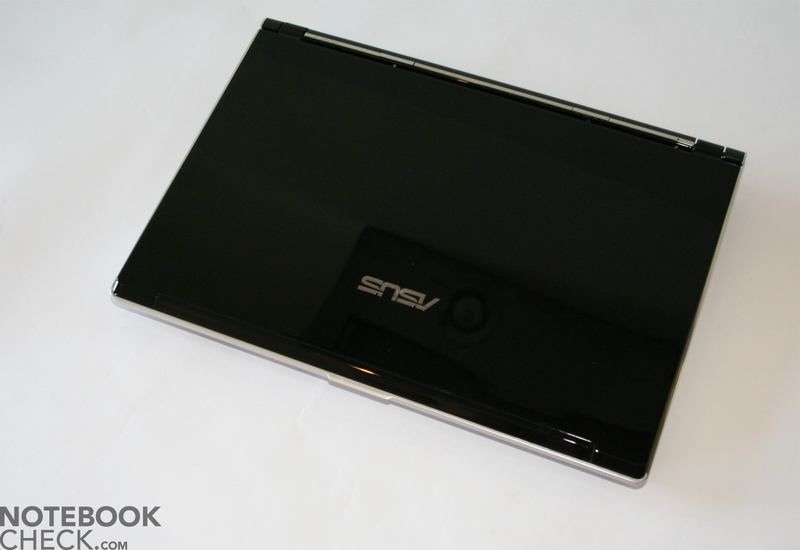 The Asus impresses from the package trough the design up to surprisingly super equipment and perfect workmanship. 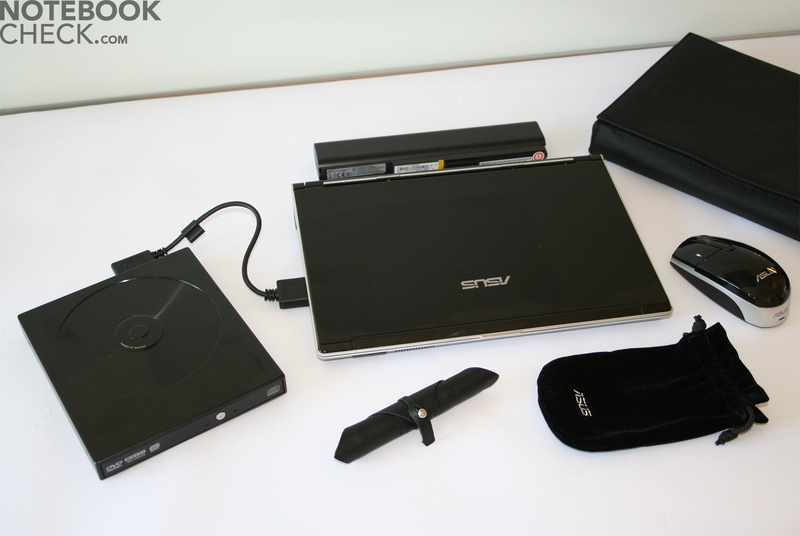 An external DVD burner, a Bluetooth mouse, an additional battery, and a notebook bag leave nothing to be desired. Also regarding battery runtime and noise emissions it can be looked up to. Unfortunately, the performance is not so good. lf you are interested in the Asus U1F notebook, we recommend to choose the more powerful version, which costs about 100 Euro more, and provides more main memory, a more powerful processor and a bigger hard disk. 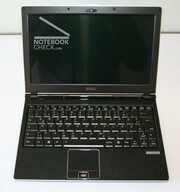 For a total of 1700 Euro, you'll get a good looking notebook, which can also convince during operation at a fair price. On the contrary, the reviewed base version, which costs 1600€ is even too slow for office and Internet applications. Still, even the more powerful version is only equipped with a moderate display. Furthermore, the temperature emission is another point of critique. 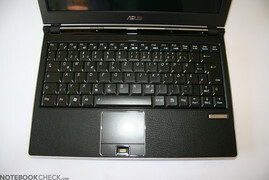 Here, Asus is in demand to improve the U1F, so, it can meet the expectations of a premium subnotebook. 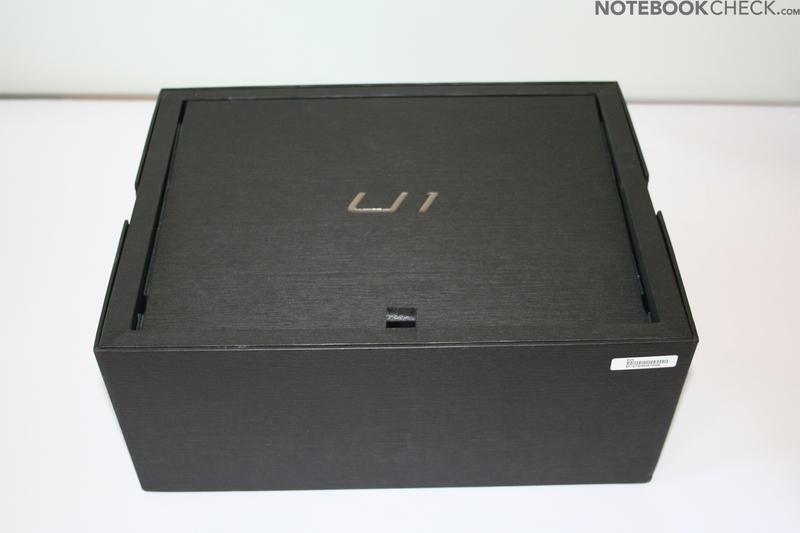 You can feel that the Asus U1F is something special as soon as you see the package. After opening the cover, you'll see a flap, which can be opened by a strap. Beneath it, you'll find a stable notebook bag with magnetic lock. In there is the Asus U1F - a real beauty. Yet, that's not all, below it there is an external DVD burner, nicely placed in the package. 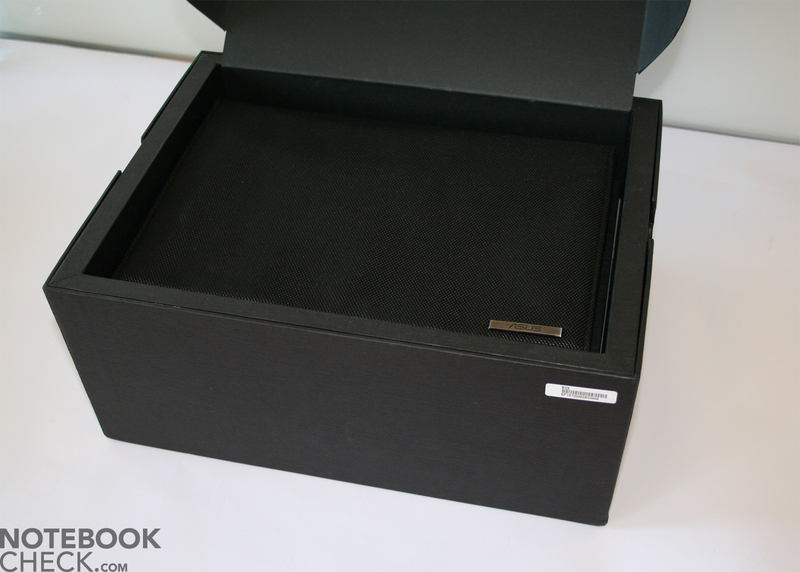 The next box provides a Bluetooth mouse in a bag, an additional battery with higher capacity and a peace of leather indicating genuineness. Unfortunately, this is necessary, because the leathery palm rest support smells like leather, but its haptics is alike synthetics.